The latest 13F reporting period has come and gone, and Insider Monkey is again at the forefront when it comes to making use of this gold mine of data. We have processed the filings of the more than 700 world-class investment firms that we track and now have access to the collective wisdom contained in these filings, which are based on their December 31 holdings, data that is available nowhere else. Should you consider Fastenal Company (NASDAQ:FAST) for your portfolio? We’ll look to this invaluable collective wisdom for the answer. Is Fastenal Company (NASDAQ:FAST) going to take off soon? The best stock pickers are turning bullish. The number of long hedge fund positions increased by 2 in recent months. Our calculations also showed that FAST isn’t among the 30 most popular stocks among hedge funds. Let’s take a peek at the new hedge fund action regarding Fastenal Company (NASDAQ:FAST). Heading into the first quarter of 2019, a total of 25 of the hedge funds tracked by Insider Monkey were bullish on this stock, a change of 9% from the second quarter of 2018. 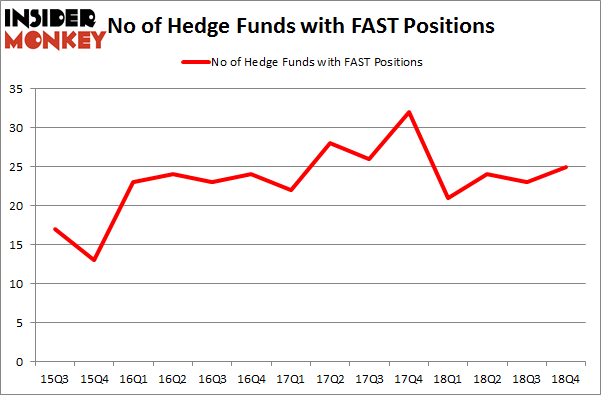 The graph below displays the number of hedge funds with bullish position in FAST over the last 14 quarters. With hedge funds’ sentiment swirling, there exists an “upper tier” of notable hedge fund managers who were boosting their holdings significantly (or already accumulated large positions). According to Insider Monkey’s hedge fund database, William Duhamel’s Route One Investment Company has the number one position in Fastenal Company (NASDAQ:FAST), worth close to $414.5 million, corresponding to 15% of its total 13F portfolio. 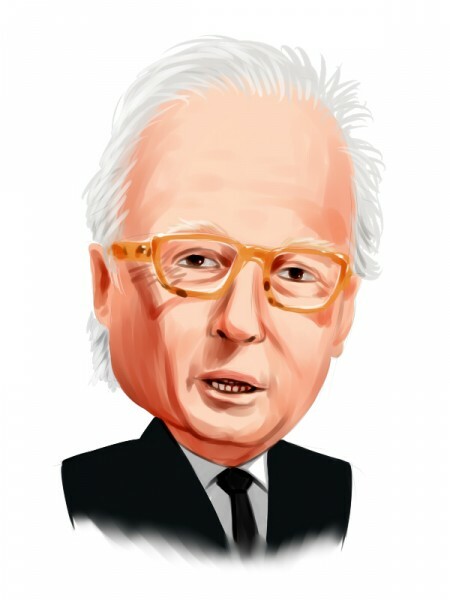 The second most bullish fund manager is Bares Capital Management, managed by Brian Bares, which holds a $248.5 million position; 7.5% of its 13F portfolio is allocated to the company. Some other professional money managers with similar optimism encompass William von Mueffling’s Cantillon Capital Management, Israel Englander’s Millennium Management and Lee Hicks and Jan Koerner’s Park Presidio Capital. With a general bullishness amongst the heavyweights, key money managers were leading the bulls’ herd. ExodusPoint Capital, managed by Michael Gelband, established the largest position in Fastenal Company (NASDAQ:FAST). ExodusPoint Capital had $4.1 million invested in the company at the end of the quarter. Michael Platt and William Reeves’s BlueCrest Capital Mgmt. also initiated a $4 million position during the quarter. The following funds were also among the new FAST investors: Sander Gerber’s Hudson Bay Capital Management, Matthew Hulsizer’s PEAK6 Capital Management, and Ben Levine, Andrew Manuel and Stefan Renold’s LMR Partners. Let’s go over hedge fund activity in other stocks similar to Fastenal Company (NASDAQ:FAST). These stocks are Evergy, Inc. (NYSE:EVRG), Freeport-McMoRan Inc. (NYSE:FCX), DXC Technology Company (NYSE:DXC), and Total System Services, Inc. (NYSE:TSS). All of these stocks’ market caps match FAST’s market cap. As you can see these stocks had an average of 36.5 hedge funds with bullish positions and the average amount invested in these stocks was $1391 million. That figure was $1017 million in FAST’s case. Freeport-McMoRan Inc. (NYSE:FCX) is the most popular stock in this table. On the other hand Evergy, Inc. (NYSE:EVRG) is the least popular one with only 25 bullish hedge fund positions. Compared to these stocks Fastenal Company (NASDAQ:FAST) is even less popular than EVRG though the sentiment is improving. Our calculations showed that top 15 most popular stocks among hedge funds returned 19.7% through March 15th and outperformed the S&P 500 ETF (SPY) by 6.6 percentage points. A few hedge funds were also right about betting on FAST as the stock returned 14.6% and outperformed the market as well. You can see the entire list of these shrewd hedge funds here.